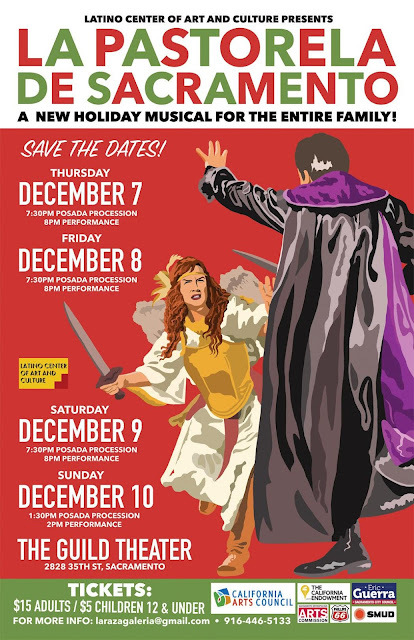 The Latino Center of Art and Culture (LCAC), Sacramento’s non-profit Latino art and cultural center, presents the 5th Annual “La Pastorela de Sacramento,” a wildly popular holiday musical for kids and adults alike. This Pastorela is a wonderful example of political theater mixed with cultural traditions mixed with holiday spirit! “La Pastorela de Sacramento” is a modern bilingual musical theater reenactment of Mexico’s traditional Christmas pageant with a contemporary bent. Satirical, poignant, hilarious, moralistic and romantic, it speaks to current times. With a new script, new director, new musical director and musicians, the Latino Center of Art & Culture (LCAC) will showcase talented young local artists offering Sacramento a musical perfect for the spirit of the season. Says Elio Gutierrez, " It is my pleasure to direct the traditional Devils and Angels in the ever-present struggle between Good and Evil, the Shepherds faced with temptations - and all the action that takes place right here in our town." The transformation of the four shepherds from the traditional Pastorelas in Mexico into contemporary recognizable figures is riveting. They are Armando, a young developer about to score a major contract in Oak Park; Carmela, a Sacramento-born former Hollywood starlet who lost everything when she refused to sleep with her producer; Juan, an Afghanistan war vet with PTSD, and Gila, a college student and homeless advocate. The four face their moral dilemmas, and realize they have to work together to help a homeless family (Mary and Joseph characters) find shelter. The finale has audiences erupting into boos, cheers and song. Written by Marie Acosta, and Tomas Benitez, the lively play brings together professional actors and community players. Original songs amplify the visual power of the show, which uses low-tech magic to great effect. In 2016, an audience member here from New York said: "At the end, when the undocumented family (Mary, Joseph and the Baby Jesus) came up on stage with the procession of actors and singers and other children, there were tears in my eyes. Why? Because the play really succeeded in making me feel that it is a sin - in the only sense of that word that I actually believe in - not to take care of other people, not to protect the weakest among us. " No Comment to " 5th Annual 'La Pastorela de Sacramento' Holiday Musical Announces 4-Day Stand at Oak Park's Historic Guild Theater "